Agency for Small Claims is a year long exhibition space. It opens conversations about art-making practices that are research-based, supporting practices that question what is public and private space. It documents art-making practices that are temporary exchanges between people, places, things, and communities. Agency for Small Claims encourages openness and generosity in art. Agency for Small Claims is a bulletin board. Agency for Small Claims collaborates from a distance with art-makers around the world. It acts as agent on behalf of knowledge transmission. It makes claims on behalf of art. The project provides a possibility for voluntary initiatives and civil society organizations to create ideas for new street names and present them in public space. It is an invitation for committed citizens to present their ideas about the society they live in, and also about the future. They were asked to propose street names that define goals and concepts of their organization and the civil society. Starting point of the project is the fact street names have always expressed a specific idea on how history or reality should be viewed. This becomes evident when we remember how many streets have been renamed in times of great changes in political systems. The interaction between the new street signs and the old original plates in the streets shall bring attention to the current social events in the city. This renaming creates a sensibility for synergies and contradictions in the development of a society, strongly influenced by overlapping of public and private interests. REINIGUNGSGESELLSCHAFT (whose German implications range from “Cleaning Service” to “Purification Society”) is an artist’s project group that works at the point of intersection between art and social reality. RG works with partners from different backgrounds, providing platforms for interdisciplinary activities. Our way of working is based on the positive potential of connecting different spheres of society. RG initiates projects that generate new relations and interest groups of people. REINIGUNGSGESELLSCHAFT understands contemporary art as a catalyst of social and political processes. Visit REINIGUNGSGESELLSCHAFT to learn more. Chto delat/What is to be done? was founded in early 2003 in Petersburg by a workgroup of artists, critics, philosophers, and writers from Petersburg, Moscow, and Nizhny Novgorod (see full list of participants on the web site) with the goal of merging political theory, art, and activism. Visit www.chtodelat.org to learn more. This is the Public Domain seeks to create a permanent international commons. The land will be free to everyone, and will be held in perpetuity. In 2003, a 2.5 acre parcel was purchased to serve as the site for the proposed public domain. Located in Tehachapi, California, sharing of this commons will be initiated when a juridical solution for public handover is found. Visit www.thisisthepublicdomain.org to learn more. Bus Stop Opera places investigations of the everyday within the realm of the extraordinary and sublime. The operas agitate the routine private space within public transportation rides through conversation and transform the everyday public space of bus stops around Pittsburgh through operatic performance of the same conversations. The conversations are composed into libretto and scored for ten to thirty minute operatic performances at corresponding bus stops. Public performances take place along Pittsburgh area transit routes, with found audiences/participants. All cast and crew utilize public transit to travel from one bus stop to the next at the completion of each opera and may perform en route to the next act or full performance. Throughout, audience collaboration with the performers is encouraged as the performers reconfigure these typical spaces. Bus Stop Opera accumulates mementos of the lives of Pittsburghers who utilize public transportation and frames the mundane as high art. Most significantly, the public is introduced to the notion that viewers of a performance may be implicated as collaborators in an attempt to create a valid illustration of reality. Visit www.busstopopera.com to learn more. 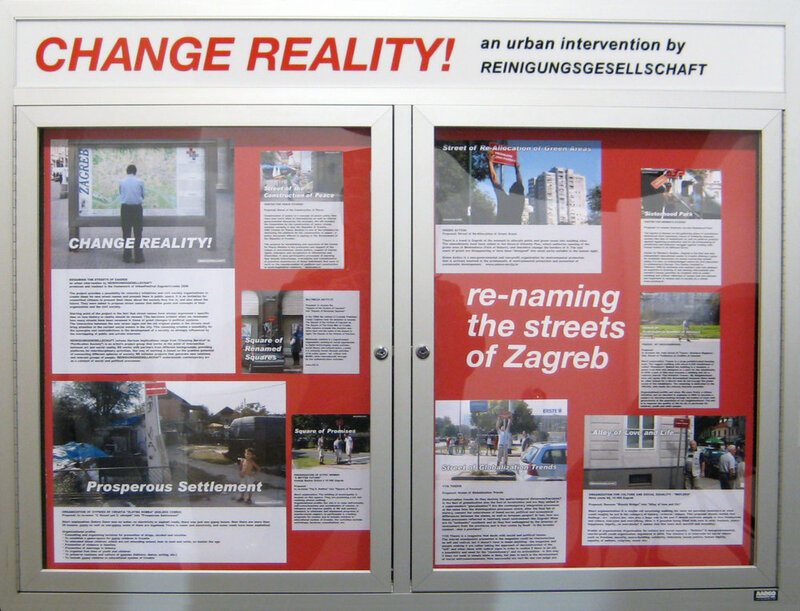 Open Futures, still here to be claimed consists of photographs of large vacant urban areas in nine capitals of the Western Balkans, including Belgrade, Tirana, Zagreb and Sarajevo. Beside documentation and archive, the project also has fictional dimensions. Although the sites are architecturally empty, they are full of stories. Each of these sites gives a condensed recollection of societal interest during previous socialist decades such as programs planned, investments and investors envisioned, and designers invited or competing. But, for some reason or coincidence all remain unexecuted--still to be claimed. At the same time current attempts to build on these sites reveal today's investments in society--foreign money, tycoons, privatization process. These sites can be loopholes, virtual spaces, that catapult us into some of the most important dimensions of the local context. They let us read their past interruptions, changes of plans, political systems, ownerships, ideologies and visions through the accretion of time in material and immaterial evidence. And their empty, yet not intentionally undeveloped, status pressures them as the signifiers of the potential futures to arrive. Starting from these story-telling voids, an imaginary map of real places is constructed--an ultimate fiction which combines all vacant spaces into “strategic emptiness," a potentiality yet to be constructed. STEALTH.unlimited (Ana Dzokic and Marc Neelen) is a practice based between Rotterdam and Belgrade. They use participatory and knowledge-based models of action, dissolving lines of interdisciplinary fields, incorporating visual culture, urban research, spatial intervention, cultural activism. STEALTH shapes opportunities where various fields of investigation can meet and where thinking about possible future(s) of the city are mobilized. Visit stealth.ultd.net/stealth/ to learn more. Street With A View introduces fiction, both subtle and spectacular, into the doppelganger world of Google Street View. Street View technicians captured 360-degree photographs of the street with the scenes in action and integrated the images into the Street View mapping platform. This first-ever artistic intervention in Google Street View made its debut on the web in November of 2008. Visit streetwithaview.com to learn more. The paper toy turning language into objects borrows its form from the tangram, a puzzle consisting of seven flat shapes that allow for different figures to appear, and its textual fragments from two reading sessions, entitled playing practice, which took place within the frame of the Department of Reading in April and July 2009. The Department of Reading is an online-based project displayed in different spatial configurations and designed to promote new forms of reading. The Department of Reading suggests a use of texts linked to questions concerning the notion of community. Within a playful gesture the Department of Reading facilitates a common use of text that allows for the indirectness of reading, the machinic aspect of technology and their different temporalities to coincide. The Department of Reading actualizes a space of and within communication that is not limited to the production of discourse, but allows for other forms of intervention and encounter. Within its online sessions the Department of Reading assembles, specifies and performs different modes of reading each with their own temporality and degree of publicness. In order to participate in a reading session of the Department of Reading, all you need is an account on Skype and a connection to the Internet for the time of each session. 23 Readings on Art, Activism & Education is Volume III in an occasional series of educational readers by the Think Tank that has yet to be named. This reader was created in conjunction with Radical Orations on Art, Activism & Education, a presentation of documentation of radical educational texts broadcast throughout Philadelphia, Boston, and Chicago in the style of public orations. The prelude conversation inspired the Directors of the Think Tank to produce this experimental project and compilation of the reader. As evidenced in the collection, the Directors believe the learning process is integral in a continual praxis dedicated to emancipatory education, critical discourse, and strategies for resistance. The Think Tank that has yet to be named initiates site-specific conversations, performative actions, and educational projects that interrogate contemporary urban issues in the places where they encounter them. As a critical praxis, the Think Tank was formed by several individuals who saw themselves and their creative practices being implicated in the dilemma of contemporary urban (re)development strategies--that is, gentrification. With the realization that the so-called “artist” is often a hapless, or even willing, tool of the hipster-fication, sanitization, and homogenization of urban space, they were compelled to critically acknowledge roles as gentrifiers and subsequently interrogate and challenge this condition. Visit www.thinktank.boxwith.com to learn more. Parking Public, A Brief Tour into the Storage of Utopia is a research initiative of the Temporary Travel Office. Parking Public documents specific histories of public parking development as it relates to the more general ideology of utopian capitalism. The Temporary Travel Office has been at work studying the changing context of parking in U.S. cities and towns, producing guided and self-guided tours to better understand how parking fits into our desires and frustrations for livable spaces. They are interested in looking at the disappearance of surface parking lots that seeems to be taking place across the country, especially in cities and towns with urban centers. To date, the Temporary Travel Office has conducted guided tours in Brooklyn, Champaign, Hollywood, and Downtown Los Angeles. The tours give Parking Public participants up close experiences with the spaces of public parking with the goal historicizing parking within the larger ideology of automobility and what Richard Davies has called an "Age of Asphalt." Temporary Travel Office's tour in Hollywood looked at the emerging relationship between neighborhood resident groups, speculative developers, architectural preservationists and tourism. Visit temporarytraveloffice.net to learn more. FERAL TRADE is a public experiment trading goods over social networks. The use of the word “feral” describes a process which is wilfully wild (as in pigeon) as opposed to romantically or nature-wild (wolf). The passage of goods can open up wormholes between diverse social settings, routes along which other information, techniques or individuals can potentially travel. The first registered feral trade was in 2003, with the import of 30kg coffee direct from Sociedad Cooperative de Cafecultores Nonualcos R.L. (CODECANO) in San Pedro Nonualco El Salvador to the Cube Microplex, Bristol UK. The import was negotiated using only social contacts, and conducted via email, bank transfer and SMS. The coffee is traded now through the UK and Europe over social, cultural and occupational networks; harnessing the surplus freight potential of recreational, commuter and cultural travel for the practical circulation of goods. New products are chosen for their portability, shelf-life and capacity for sociability: feral trade goods in current circulation include the coffee from El Salvador plus grappa from Croatia, mountain-grown antidepressants from Bulgaria, and fresh sweets from the Islamic Republic of Iran. The feral trade of tea from Bangladesh is illustrated here. Design and production of documentary product packaging is an integral part of the feral trade process, with an intention to reveal details of source, shipping and handling with the micro-attention that often accompanies ingredient listings. Visit feraltrade.org to learn more. Temporary Services is Brett Bloom, Salem Collo-Julin and Marc Fischer. Based in Illinois, the collective Temporary Services has existed with changing members and structures since 1998. Temporary Services produces exhibitions, events, projects, and publications without attention to separate art practice from other creative production; it obscures existing delineations of disciplines and systems of cultural production. Temporary Services reflects the desire to provide art as a service to others and to consider closely the social contexts in which art is produced. Temporary Services is interested in the way art is experienced in everyday life. The collective is interested in transforming art from a privileged, rarefied experience to something more directly related to how we live our lives on a daily basis. This intent includes removing the influence of select individuals who determine how art is seen and interrupted and expanding the sites traditionally sanctioned for experience of art. Art Work: A National Conversation About Art, Labor, and Economics is an independently published, 32-page newspaper produced by Temporary Services in collaboration with the non-profit arts organization SPACES in Cleveland, Ohio. Art Work is a newspaper that consists of writings from artists, activists and academics on the topic of working amidst depressed economies and how that impacts artistic process, compensation and artistic property. The newspaper is distributed free throughout the United States and Puerto Rico. The Bureau for Open Culture’s Agency for Small Claims is proud to contribute to the distribution via a pdf available here and through December 18, 2009 copies available on the campus of Columbus College of Art & Design. Visit temporaryservices.org to learn more.